Farmers and other Commodity Classic attendees will once again have the opportunity to welcome U.S. Secretary of Agriculture Tom Vilsack to the annual convention and trade show for corn, soybean, wheat and sorghum growers. For the fifth year in a row, the secretary will deliver a keynote address to an expected crowd of more than 6,000 during the event’s General Session, scheduled on Friday, Feb. 28, in San Antonio, Texas. Secretary Vilsack was appointed by President Barack Obama as the 30th Secretary of the U.S. Department of Agriculture and took office in January 2009. He was reappointed soon after the president’s reelection in 2012. Previously, Vilsack served two terms as governor of Iowa. 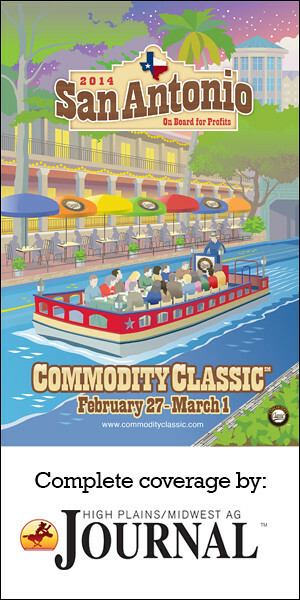 Presented annually by the National Corn Growers Association, American Soybean Association, National Association of Wheat Growers and National Sorghum Producers, Commodity Classic is America’s largest farmer-led, farmer-focused convention and trade show. The event offers a wide range of learning and networking opportunities for growers in the areas of production, policy, marketing, management and stewardship-as well as showcasing the latest in equipment, technology and innovation.